Ohhhhh you guys. Oh man. I’ve got a long and sordid tale to tell you. 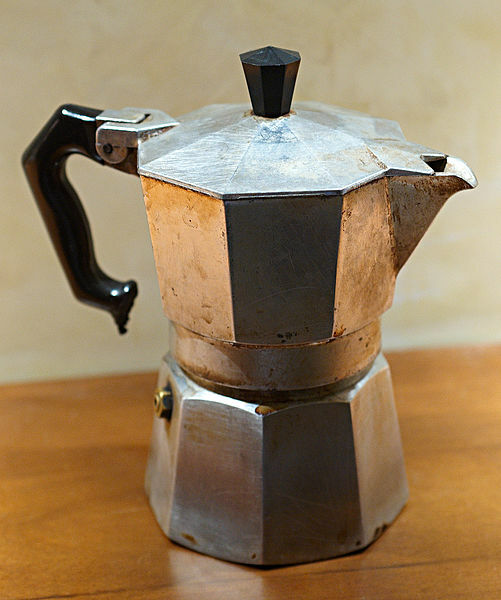 It starts, as all good tales do, with coffee, and ends with a wondrous little invention called the moka pot. I’ve been periodically documenting my decline into a raving coffee addict, and I believe I’ve just entered a new and exciting phase. Although I dearly love espresso, I have been perfectly happy with my regular old 4-cup, standard (drip) coffee pot (unless I can convince my sister-in-law to lug her espresso maker to our house whenever she visits). Sara, however, not so much. The thought of hot water traveling through all that BPA-laden plastic sends shivers down her spine. She has mostly tried to stick her her cold-brewed coffee, but making it is a hassle in the extreme, and often not really worth it. So occasionally she had to resort to regular drip coffee, BPA and all. It occurred to me that there were many different ways to make coffee, each with their own pros and cons, but surely there had to be a method out there that didn’t have any plastic parts. After some research (yes, I will research anything, even coffee making) we finally settled on a French press. Simple, straight-forward, time honored, and very similar to making cold brewed coffee. Several members of my family are already French press converts. Finally, one day at Target and we decided enough was enough, and it was time to bite the bullet. We took a look at their fine array of French presses, and there was not a single one that didn’t have plastic. Frustrated, we decided we would look online when we got home. However, down at the end of the row, was a little Bialetti moka pot, with the coffee part made entirely of aluminum. I had come across the moka pot in my research, but seeing it there in the flesh at Target somehow piqued my interest. However, we didn’t buy it then and there (did I mention I’m a researcher?). Strangely enough, just a few days later Sara had an amazing cup of coffee at a friend’s house, who happened to own a moka pot. The rest, as they say, is history. This thing is awesome. It’s an espresso maker, but without all the crazy parts or fancy techniques. It’s kind of like one of the old percolator pots, though the brewing mechanism is entirely different. You just put in the water, espresso, and set it on the stove. That’s it. Ours makes enough for Sara and I in just under 7 minutes. The Internet tells me that it’s not *exactly* espresso. The mechanism is the same, but it produces coffee at a mere 1 bar of pressure, rather than the required 9 bar. I don’t doubt that someone can make better espresso, but for a simple, low-cost, hunk of aluminum, my mouth can’t taste the difference. This thing makes *amazing* coffee. One hard thing to get used to with drinking espresso is that you’re drinking a lot smaller volume. Think quality, not quantity. It turns out that a lot of my coffee drinking was more just to have something to do. You must not drink the same volume of espresso as I used to drink of coffee (or else there will be a *lot* more blog posts around here!). So, moka pot. Highly recommended. It will change your life. Maybe you dont know that aluminum collects in the brain and may cause alzheimer’s…go stainless steel, we did 3 years ago and have never looked back! Can I also just say that we’re definitely in the future, where we can discuss this in the comment section of old blog posts! And this, on the day when I just discovered that AIM is still around.